The Coral Sea Islands Territory includes a group of small and mostly uninhabited tropical islands and reefs in the Coral Sea, northeast of Queensland, Australia. The only inhabited island is Willis Island. The territory covers 780,000 km2 (301,160 sq mi), extending east and south from the outer edge of the Great Barrier Reef, and includes Heralds Beacon Island, Osprey Reef, the Willis Group, and fifteen other reef/island groups. The Coral Sea Islands were first charted in 1803. In the 1870s and 1880s the islands were mined for guano but the absence of a permanent supply of fresh water prevented long-term habitation. 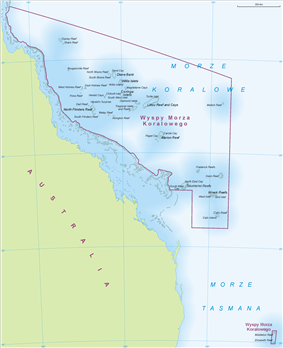 The territory was created in 1969 by the Coral Sea Islands Act (prior to that, the area was considered part of Queensland) and extended in 1997 to include Elizabeth Reef and Middleton Reef nearly 800 km further south, already in the Tasman Sea. The territory is a possession of Australia, administered from Canberra by the Attorney-General's Department (before 29 November 2007 administration was carried out by the Department of Transport and Regional Services). Defence is the responsibility of Australia, and the territory is visited regularly by the Royal Australian Navy. Australia maintains automatic weather stations on many of the isles and reefs, and claims a 200-nautical-mile (370 km) exclusive fishing zone. There is no economic activity (except for a significant but as yet unquantified charter fishing and diving industry), and only a staff of three or four people to run the meteorological station on Willis Island (South Islet), established in 1921. In November 2011 the Australian government announced that a 989,842 square kilometres (382,180 sq mi) protected area was planned in the Coral Sea. There are about 30 separate reefs and atolls, twelve being wholly submerged or drying only during low tide, and 18 others with a total of about 51 islets and cays (18 alone on the atoll Lihou Reef), some of which are vegetated. The atolls exhibit a wide range of size, from a few kilometres in diameter to perhaps the second largest atoll in the world by total area (including lagoon): Lihou Reef, with a lagoon size of 100 by 30 km and an area of 2,500 km2, which compares to a combined land area of the 18 individual islets of only 0.91 km2. The islands are all very low. The territory's FIPS 10-4 code is CR, whereas ISO 3166 includes it in Australia (AU). The Willis Islets are important nesting areas for birds and turtles but contain negligible natural resources. They comprise less than three square kilometres of land. There is no port or harbour, only offshore anchorage. Mellish Reef, being about 300 kilometres to the east of the Northwestern Group, thus the most distant from the Australian continent of all the reefs and atolls of the Coral Sea Islands Territory, is not considered to be part of any group. It has the outline of a boomerang-shaped platform around 10 km in length and 3 km across, area 25 km2. 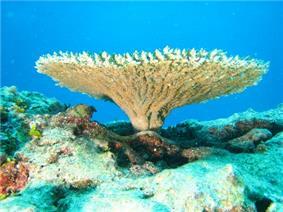 The surrounding reefs, which enclose a narrow lagoon, are completely submerged at high tide. Near the centre of the lagoon is the only permanent land of the reef - Heralds-Beacon Islet. The island is a small cay measuring 600 m by 120 m, area 57,000 m2, only rising a few metres above the high-water mark. Middleton Reef, atoll about 8.9 by 6.3 km, area 37 km2 including lagoon, one islet: The Sound, 100 by 70 meters (area 5,000 m2), highest point close to the Northern end 1.5 metres. At low tides much of the reef flat is exposed. Elizabeth Reef, atoll about 8.2 by 5.5 km, area 51 km2 including lagoon, one islet: Elizabeth island (Elizabeth cay), no vegetation, 600 metres by 400 metres (area 0.2 km2), highest point 0.8 metres. At low tides much of the reef flat is exposed.